Most everyone has heard of the famous Broadway musical Show Boat, but few realize that the story was based on an actual floating theater from North Carolina. 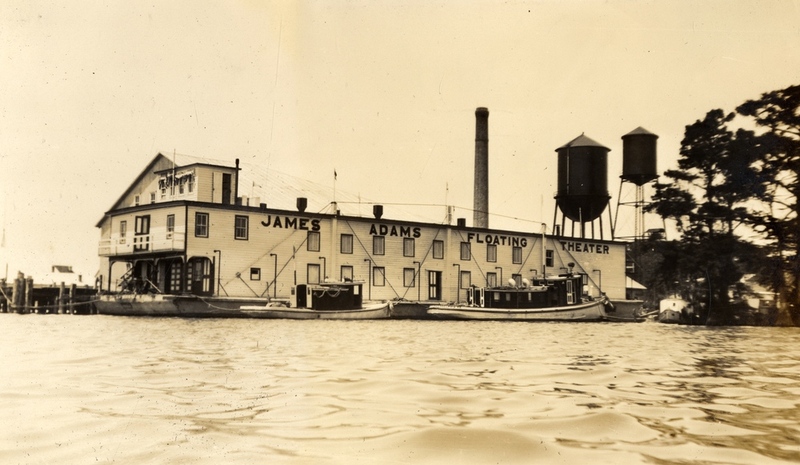 The James Adams Floating Palace Theatre brought show business to remote towns from the Chesapeake to the Savanna River, including its home waters of Albemarle and Pamlico Sounds. Entertainment, like everything else along the waterways, was delivered by boat. Circus animals were carried to Harkers Island by ferry and traveling road shows and Chautaugua productions sailed to Hatteras and Ocracoke. But there was nothing quite like the pomp and glamor of the James Adams Floating Theatre. Converted in 1913 from a lumber-hauler in Washington, North Carolina, the 128-foot double-decker barge was hauled around by tugboat for almost three decades. A “floating palace” it was, outfitted with a 522-seat theater plus balcony seats for non-white patrons. Thirty-two staterooms housed the actors and musicians, while stage hands slept in the dressing rooms. Some of the tugboat crew doubled as musicians. James Adams, a former trapeze artist, owned the boat with his wife, and his younger sister Beulah became the showboat's leading lady. His brother and sister-in-law helped manage the business side of the production. "Adams' Show Boat was a place for dressing up, so everybody dressed up a lot when they went there," said Cora Mae Basnight of Manteo. "It was a bit of elegance that now is past." When townspeople heard the raucous music of the calliope steam organ, they knew that the show boat was in town! The showboat troupe often paraded through town upon arrival, tugboat hands doubling as musicians. Intrigued by the idea of a show boat, novelist and reporter Edna Ferber left New York for North Carolina in 1924. She arrived in Bath, declaring it a "lovely decayed hamlet," and was overjoyed to find the James Adams at its home berth. Ferber met the production's top stars, Charlie and Beulah Hunter. “Beulah,” Ferber wrote, “was known as the Mary Pickford of the rivers.” Although the show boat was preparing to be mothballed for the winter in Elizabeth City, the actors – familiar with the writings of Ferber and a fan of her novels – invited her to accompany them for the first few days of the Spring season. “When April came,” Ferber wrote, “I went as eagerly as a lover to meet the show boat.” For four days in 1925, she lived among the actors and crew, observing daytime rehearsals and evening shows. She even helped sell tickets at the box office window, charging 35 cents for the 8pm show. “I watched the Carolina countryside straggle in,” she wrote, “white and colored.” Charlie Hunter, lead actor married to Beulah, told Edna Ferber that they kept their storyline simple to appeal to the hardworking farmers and fishermen of rural South. "We give them the old fashioned hokum," he emphasized. "All about mother love, faithful and unfaithful sweethearts, the lamp in the window, an occasional villain, and all in a play full of smiles and tears..."
The notes Edna Ferber took of her adventure and interviews were eventually woven into her novel Show Boat, which took place on the fictional Cotton Blossom Floating Palace Theatre on the Mississippi River. The story was both controversial and wildly popular, and subsequently made it to Broadway and the Silver Screen. The James Adams Floating Palace Theatre was the last working show boat in the American South, as motion pictures grew in popularity and competed with the live shows. The massive barge caught fire twice, finally coming to rest in the Savannah River in 1941. Loy, Ursula and Pauline Worthy. Washington and the Pamlico. 1976. Washington-Beaufort County Bicentennial Commission. Moore, Mark A. 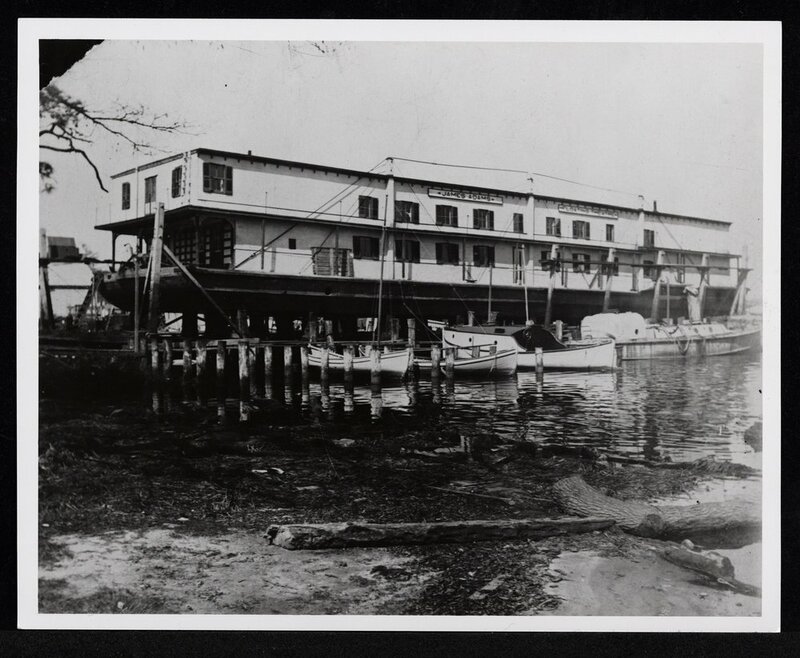 “Edna Ferber and the James Adams Floating Theatre,” North Carolina Historic Sites. Tate, Suzanne. Memories of Manteo and Roanoke Island, N.C. as told by Cora Mae Basnight. Nags Head, NC: Nags Head Art, 1988.